Producing Update, June 2014 | Katarina G.
Now that Cannes is over (and I am over my three week Cannes Cold, or whatever that nightmare bug was), it’s time to get back to work. Two major projects are my current top priority. 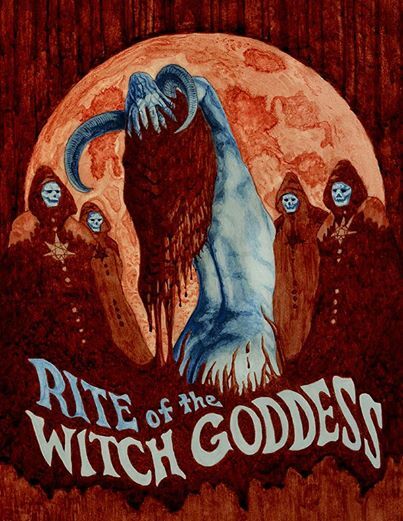 First up, Rite of the Witch Goddess, the film I’m co-writing with James “The Demon’s Rook” Sizemore and producing with Tim “Also The Demon’s Rook” Reis. The film was accepted into Fantasia’s Frontières co-production market on the basis of a pretty slick package (and, in my humble cowriterly opinion) a pretty great script that James and I cobbled together over the past few months. I learned a lot of lessons from last year’s Frontières experience and I’m anxious to apply them this summer. I learned what makes a successful pitch, and a successful presentation package, so we’re hard at work on all that. you already want to see it, am I right? I also learned to never waste a second of my time working with people who aren’t 100% interested in working with me and who aren’t as respectful of my time and contributions as I am of theirs. James and Tim are awesome, supremely collaborative, open and generous partners to be working with and I’m really happy to be developing this project with them. We’re getting our agreements and paperwork in order (I can’t advise this enough, Junior Producers! ), but we’re also communicating really well about what we all want (in the script, in the way we put the project together, and so on) so it’s been very rewarding. I’m looking forward to hopefully blowing some people away with a few of the things we’ve cooked up for our presentation, too. My ambitious goal with this project is to line up enough partners at Fantasia and the next few festivals and markets to follow (TIFF, perhaps AFM, definitely Berlin) to be able to shoot the film next summer. At least half the film takes place outside and requires a lot of idyllic, lushly green locations, so summer would sure work well for us. The second project is the noirish murder-mystery I’m working on with Peter Lynch, Birdland. The script has been polished up and over the past few months we’ve done a huge amount of work to secure a solid Exec. Producer and submit funding applications to all the usual suspects (Telefilm, OMDC, Harold Greenberg Fund and so on). Now, we keep pushing the project forward in other ways as we wait for some decisions to come in. The funding decisions we get won’t dictate whether the film gets made or not (we’re committed to doing it no matter what) but they will affect our timeline. If everyone hands over buckets of dough, then we might be ready to shoot as early as this fall. More realistically, we’ll get less than we asked for from everyone (that seems to be a common scenario, based on stories I’ve heard from other producer pals) and will have to go into serious fundraising mode this fall in the hopes of raising the rest quickly and shooting in early 2015. I think the latter plan is more plausible but you never know. Better to be ambitious than not. We’ve already got a lot of good will and support on the project, so nothing is out of the question. Beyond these two films, which are taking up 90% of my summer focus, I’ve also got two others percolating in the back of my mind. One’s an original story idea that I hope to find time to write into a script this August. The other is an idea I’ve been bandying about with a filmmaker friend, which I very much want to make happen. And of course there’s the rest of the Ultra 8 Pictures development slate, but in all honesty, I have to let the writer/directors of some of those projects carry the torch themselves for a little while, because there aren’t enough hours in the day, and I don’t get a suitcase full of money from Telefilm for my development slate, so I can’t pay myself, let alone anyone else, to get some scripts polished up so that I can take them into the world and try to make something of them. I got some good advice this Cannes from a friend (a successful and wise talent agent) about working only on the projects I’m most passionate about with the people I really want to spend a lot of time with. It might seem obvious, but it was kind of a revelation. I realized that I do actually spend a lot of my time trying to push forward way too many things, which means I can’t dedicate the right level of energy to any of them. So, the lesson of summer is: choose priorities wisely, line things up and get them done piece by piece, instead of trying to do everything at once. Easier said than done, probably. I also have programming The Royal and helping REEL CANADA put together the 2014-15 catalogue (10th anniversary, yo) and helping Colin meet his TIFF deadlines and y’know, trying to spend at least 30 minutes a week actually enjoying the summer. I want more of this in my life, y’feel me?